This has been my third post on irregular verbs in a short time. In the first two posts I have tried the associative method, and MP3 drills. While the associative method was not that successful the MP3 drills certainly work. However, they presuppose that the students will learn at home and will play the recording twice or three times at least. But in reality students mostly work with each material only once. Therefore we need a material which will teach the irregular verbs in one or two activities. In this post I have tried to come up with such activities. 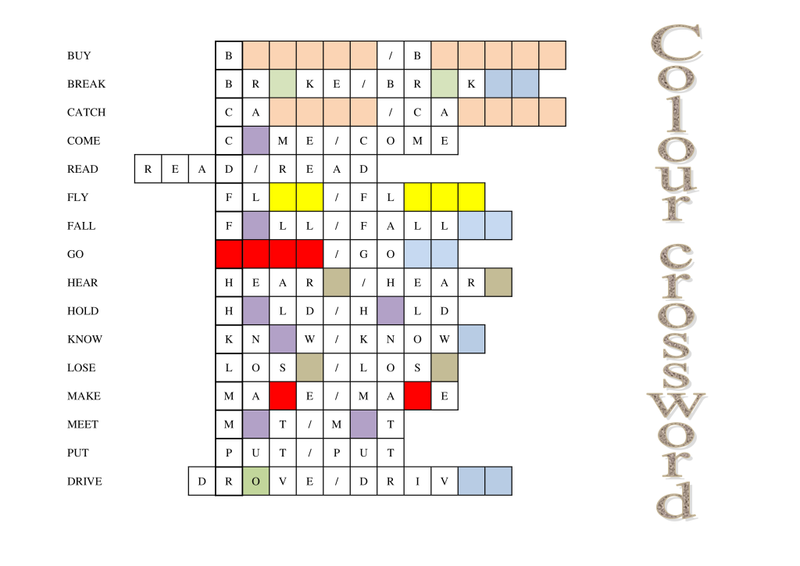 There is the colour crossword and Remembering tables. The students should learn 16 irregular verbs here. There is a pre-test and a post test which will test the students’ knowledge before and after the activity. I hope the teaching will be successful this time. If you are a learner of English please take this pre-test. You will see how many of the 16 irregular verbs you already know. You will be asked to give a name. It does not have to be a real name, but use the same name in the post test, too. Why do we want your name. We would like to conduct a research and see how effective the method of teaching is. Of course, we will publish the results here. In this part you will find two methods how to learn the irregular verbs. The first one is called remembering tables. Print out the worksheet. Have a look at the first table and try to remember all the words there. Once you feel that you know them, cover the table and write all the words into the table on the right. Having finished, check your answers and correct them or complete them. Do the same with all the other tables. If you teach a class you can use the same worksheet but set time limits for learning the words. I usually go through the tables and ask the students to repeat the words after me and then give them between 20 and 45 seconds to remember the words. The colours have their own logic behind them. Have you done all the activities above? So now take the test and see how many irregular verbs you know now. Is it better? I wonder how you made those great infographics and games. I like to produce some as well, as I have a few ideas. I have been using the programmes iMindmap, eDraw and Inspiration.